Yesterday, I noticed that Blogger filters the postings on this site for spam. Since I didn't even know I had a spam box, I apologize if your post to this site was not immediately posted. I'm not intentionally filtering thoughts or opinions - in fact I welcome them. Some of you are sending me personal e-mail and that's fine too, but you're welcome to post to this site. I'll try and read your thoughts there also. An anonymous reader wrote to me and commented about the ridiculous picture of Emperor Norton on his bike asking if the Norton pictures were staged or not. Unfortunately, I don't have any way of knowing Norton's true mental state. It is curious to me too. Some of Norton's actions seem like he's playing things up, but sometimes he seems genuinely confused. I think some people got a kick out of the whole event and fed his bewilderment. For example, his uniform with epaulettes was not something he designed or created, but a donation from soldiers at a local military installation. Some of his other outfits were too. Many people were suspicious that Norton was actually rich and somehow making money of a grand charade or conning rich people. When Norton died however, an inspection of his apartment revealed that he was completely broke. Yet somehow, he seemed aware of the world enough to regulate his finances by changing interest rates on bonds he issued and to write timely proclamations to local newspapers. I suppose his sanity may just have to remain a mystery. 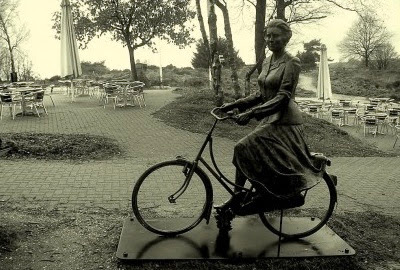 On another note, as I reflected on Norton on the bicycle, I kept thinking how the bicycle can be a rather undignified mode of transportation for a leader. 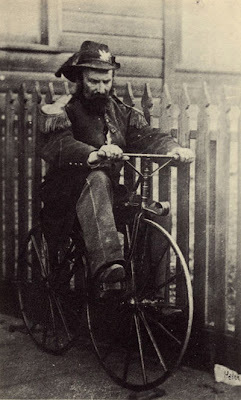 Somehow epaulettes just don't seem altogether right on a bicycle (and I hope he wasn't wearing his sword). 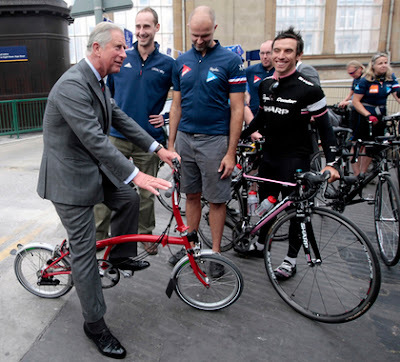 Then I got to thinking that the last time I recall seeing a world leader on a bicycle, it certainly seemed less than regal. Hmmm. 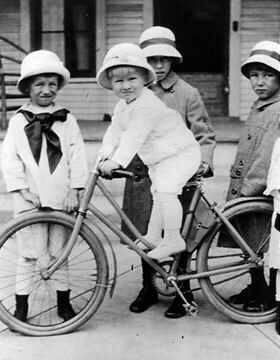 Okay, rigid posture, high seat with lowered handlebars, seat post attachment thing, and I'm all for safety, but that helmet with the strap seems to convey a sense of an overprotective mother (and I feel bad about even thinking that because I'm all about safety on bicycles). Okay, a little better, but I'm sorry, this still looks like a guy who has never ridden a bike before renting one. Maybe if he were wearing shorts it would look better. Then again, maybe not. Either way, he's got to get a different style bike. This one almost looks like a lady's bike. 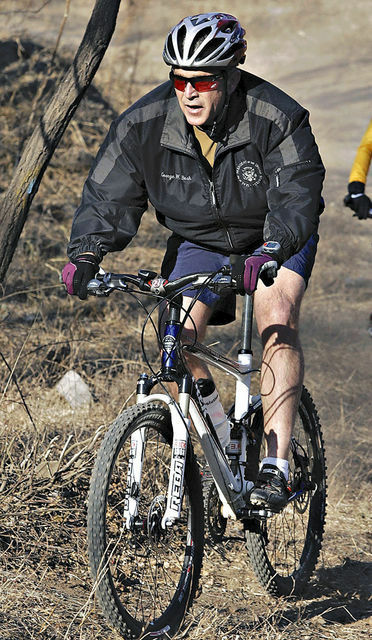 I started doing a quick Google search and it turns up that other leaders have a hard time looking dignified on a bicycle. 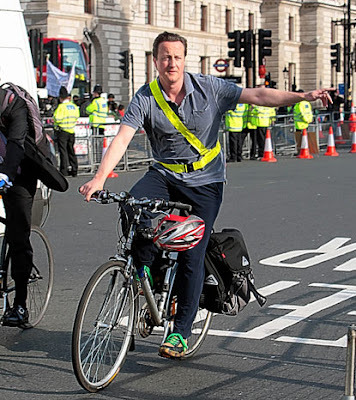 He certainly looks more comfortable on a bike, but what's with the safety sash? The thing that really bothers me about this is he's wearing a silly reflective sash while his helmet hangs from the handlebars! And green shoelaces? Seriously, you're not in middle school anymore! 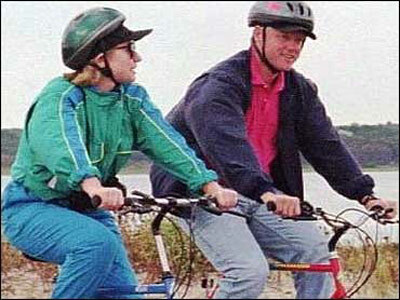 So then I was thinking it must be the wearing of pants or something and I figured Jimmy Carter must have some ridiculous photo of him on a bike. But I was wrong. 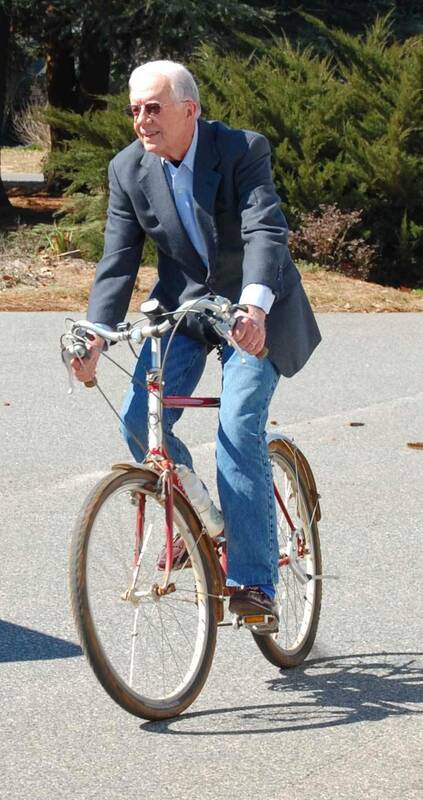 President Carter looks just fine on a bike, without a helmet and in more formal attire. What gives? Can you figure out the formula for leaders looking okay on bicycles? He's got a helmet and looks just fine, but then again he's wearing shorts. 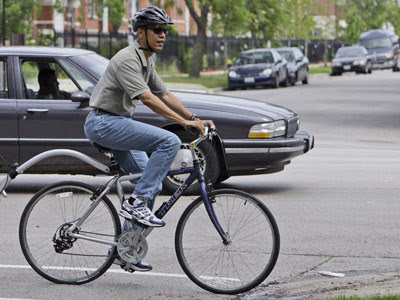 Maybe it's because we associate bicycle riding with childhood that it doesn't automatically look good to see our leaders on two wheels. Okay, mirrored sunglasses, black gloves and open shirt. 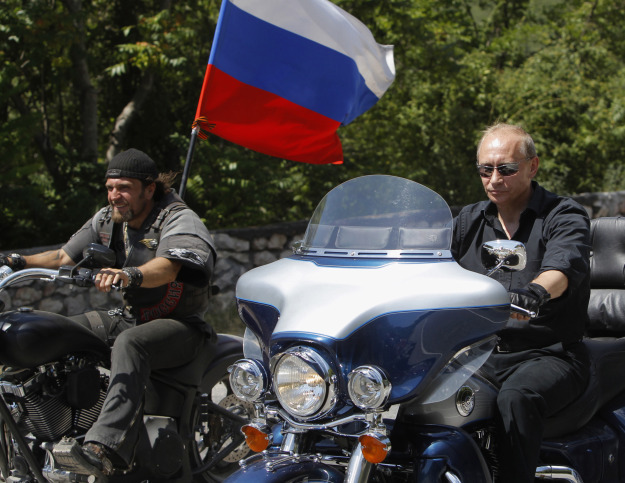 I'm sorry, I think our leaders still have a bit to learn from Russia on how to project authority. Well I'm not sure anyone looks good in a bike helmet. I AM positive no one looks good in an equestrian helmet but I wear one anyway because I don't want to wind up stoopid and drooling from a head injury. Emperor Norton - what a hoot! I would never have guessed that in a million years! Love your history Nate. Merideth, I think you've hit on something. 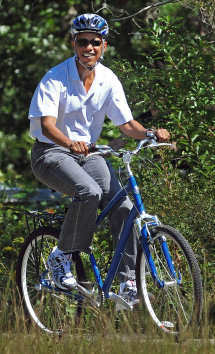 Its got to be really difficult for a world leader to decide to wear a helmet or not. They have to run the risk of looking silly or getting criticized for not being safe. I think Pres. Obama only looked awkward in the second photo - it's an angle thing. Helmets aren't fun to wear, but they aren't meant for fun (alas!). I think you've either got it or you don't.